MSP Peter Chapman at Banff Primary School. A north-east primary school is struggling to find a pupil support assistant – despite advertising for the post six times. 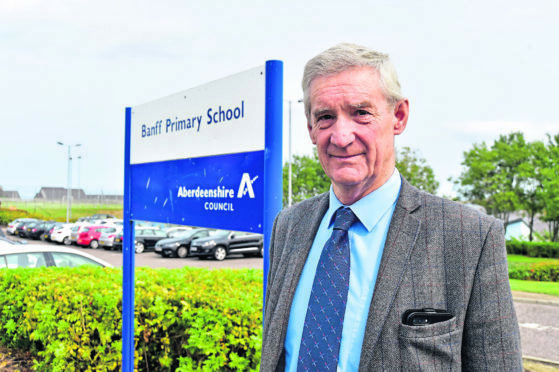 Aberdeenshire Council has advertised the additional support for learning post at Banff Primary School repeatedly since January 25, but despite the £8,000 relocation package – attached to all teaching posts in the region – a suitable recruit has not been found. The vacancy highlights the authority’s ongoing recruitment problem, with many potential teachers reluctant to move to the north-east due to the high cost of living. As revealed in the Press and Journal earlier this month, there were 55 teacher vacancies in Aberdeenshire when the new term began. Last night, North East Tory MSP Peter Chapman said the ongoing problem at Banff highlighted the need for the SNP to do more to tackle the issue. He said: “This is a prime example of the difficulties that councils like Aberdeenshire face in recruiting staff to our local schools. “Despite the best efforts of the education authority, including a substantial relocation package, this post remains vacant. “This is a complex issue and there is no quick fix. However, there is much more that Nicola Sturgeon and the SNP could be doing. “We need more university places for teachers, and we need to remove some of the red tape that staff trained in England face in order to get into a classroom north of the border. “Our councils are going to great lengths to fill vacancies across the north-east, but the buck stops with the SNP government in Edinburgh. But Banffshire and Buchan SNP MSP Stewart Stevenson said the council has the “ability” to “try harder”. He said: “Additional support for learning teachers are an important part of the educational system provided by Aberdeenshire Council. “Only a few days ago I discussed this with a local ASL teacher who was thoroughly enjoying working in the north-east. “The council must try harder and use other means such as social media to contact ASL teachers looking for new positions. A Scottish Government spokesman added that in 2017, £88million was invested in teacher recruitment. An Aberdeenshire Council spokeswoman said: “We make every effort to fill every teaching vacancy across Aberdeenshire. “This includes advertising on a range of websites, in the press and via social media as well as encouraging more people to join the profession through a variety of training routes.